Best of the Best: There are 6 Over-Forty Fashion Blogs that I Can't Live Without. Helga Von Trollop Tops the List. Being over forty doesn't mean you have to give up fashion. The Citizen's +40 blog roll is now well over one hundred blogs strong, and this +40 blogs aren't just being read by the over forty crowd. People of all ages seem to be waking up to the fact that age ain't nothing but a number and, and women of all ages can, and are, rockin' original style. Women, all shapes, sizes and color, from all over the world are united in one common factor: THEY LIKE TO DRESS UP. And we, like to watch. Pull Up Your Socks is the spirited style blog from the fabulous Desiree, of Down Under. A journalist, a newlywed, a mother and monster hotty, this bright bleached babe intends to "grow old disgracefully." Turning heads while having fun, Desiree equally pulls off wearing prim and proper vintage suits to Black Milk swimsuits + leggings. She's never met vintage lingerie she didn't like, or was afraid to wear out in public, for that matter. Desiree infuses joie de vivre in her way of dressing, usually sporting her signature Doc Martins or Vivienne Westwood winged platforms. By dressing how she pleases, Desiree encourages our own personal style to take flight. One of the most soulful blogs on my blogroll, the Style Crone is as sensitive, introspective and wise as she is outlandishly stylish. Judith, a svelte beauty who hails from Denver, Colorado dedicates the Style Crone to "the older woman, in her most creative, outrageous, authentic, powerful, adventurous, funny, and proud era." Now in her late '60's, the SC (as she likes to call herself) is not mere model for her wonderful wardrobe, but living proof of beauty shining brightly from the inside out. Her posts, heartfelt and honest, are as are as much about the art of living as they are about the outfits. Her taste is impeccable as is her extensive vintage collection, but more exquisite is the dignified and graceful way she wears it. Sacramento is the enchanting force behind Mis Papelicos, a plus forty personal style blog from Spain. She is enthusiastic about people, bright colors, bold prints and secondhand shopping. 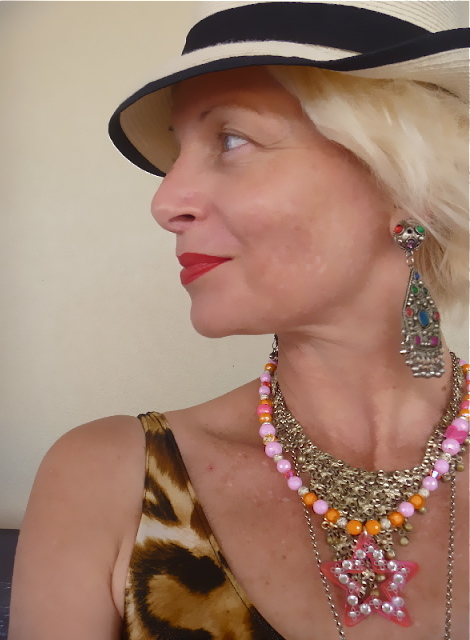 Writing in both English and Spanish to an international readership, Sacramento shares her love of pattern mixing and colorful outfits, her style inspirations and projects, as well as sharing kindly worded blogging tips to an enthralled and vast audience of women in every age bracket. This Brit comes with heat. A self described "jumble sale-ing, car-booting, skip-diving, charity shopping, hedonistic hippy chick in love with life, India and vintage clothes" is a woman who can, and will single-handedly bring back the maxi. She chafes at bland admonishments to "dress your age," and is a great example of the enduring cool of vintage 60's style. Part hippie, part goddess, The Vintage Vixen, or Vix as she is known to her devotees, was recently voted as one of the top 10 best vintage blogs by Cison, and after a few visits to her blog, you'll see why. I confess: I have a serious blogger crush on the vintage soaked Kiwi experience known as Helga Von Trollop. It really was crush at first sight. . Helga lives loud, dresses loud, and is so unabashed and unapologetic with her style, you can't help but gain a little courage from the way SHE wears her clothes. Her persona is big, bold, beautiful and larger than life. This gal reeks rock-n-roll, and is somebody you just know you'd get on with in real life. And is someone who can rock a vintage 50's frock like nobody's business. SQEEEEEE! Advanced Style is a street style blog. It's a street style blog about stylish folks over 50 by a man under 30. Ari Seth Cohen started taking photos of the "sterling set" around 4 years ago, and his pictures have captured the hearts of all ages. Filling a neglected niche, Ari shows that fashion is alive and kicking on stylish folks well into their 80's, and even beyond. "I just photographed 100 year-old Elise on Madison Avenue," Ari recently tweeted. Readers often comment about how the blog gets them to re-assess their own style of dress. A friend of mine in her 40's, commented that the women of Advanced Style dressed much, much more stylishly than her, and she was now inspired to step it up, and stop giving up. Advanced Style features a stable of regulars, mostly fabulously over-the-top mavens who live in New York, many of them inspiring young girls to boldly express themselves, including the tween blogging prodigy, Tavi of Style Rookie. "I love when young girls email me saying they can't wait to get old after seeing the Advanced Style ladies," quips Cohen. Advanced Style definitely gives us all something to look forward to. Coming Soon: Advanced Style the BOOK. 240 pages dedicated to the fierce, fab style of the "sterling set." Inspiring a generation or two to come, the wonderful ladies and gents in this "ode to the confidence, beauty, and fashion that can only be achieved through the experience of a life lived glamorously." Expect to see more of the inspiring expressions of fashion that you'll find daily on Advanced Style the blog. Advance order your copy of Advance Style today. Now available on Amazon.com. The gorgeous Desiree is "Growing Old Disgracefully"
For a more extensive list of fabulous over forty bloggers, please check out my +40 Blog Roll by clicking HERE. A big thank-you for my sponsors who make posts like this possible. Style Made By Hand: Recently retired Susan re-discovers her passion for clothes by sewing them. This is one of the most awesome list ever. I am sooooooooooooo honoured by you putting me amongst the best company EVER. My dearest Bella, you are an angel and my favourite soul mate. Great post Bella, I read loads of these ladies already, and you've really captured what they're all about. If I'm one third as fabulous as them when I'm 40 I'll be more than happy! Dear Bella, thank you for the honor of inclusion as I found myself in the company of these amazing over 40 bloggers. Your generosity of spirit and magical way with words are always an inspiration! I'm a huge fan of Desiree and Sacramento, along with Advanced Style. Really looking forward to checking out the others. My grandma and mom have always been super stylish, so it's never been a surprise for me to see well-dressed older women. Ladies like this give me hope for the future me. Yes, these are some of my favorite women in the world. I found your blog via Vix :) I love that you love Helga and Desiree and Vix and the whole wonderful kooky awesome bunch of ladies who's blogs always make me smile, think and laugh. Can't wait to read more from you. Love it! I read mis papelicos and pull your socks up religiously. Think I might need to add a few others to my blog roll to. You know what I like most about this list? The fact that 4 out of the 6 you have featured are already on my blog roll and are blogs I have been an avid follower of for ages. And even better is that, for me, I don't really register age when I'm looking at great blogs, only individual style and personality (perhaps that's a luxury of being 16). I love having such diverse, worldwide blogger 'friends' in a blogosphere where age registers way, way below style. I know about two of the ladies on this list and they're already part of my daily read. I have to take the time to check out the others. Thanks for the heads up! I love all of these fantastic blogs. Such stylish ladies! Oh, goody! I don't know half of these. Thanks for leading me to them.